Tiger Woods’ victory at the 2019 Masters was perhaps one of the most stunning sports comebacks in recent history. Woods underwent his fourth back surgery in 2017, and at the time, had not played in a major tournament in more than 18 months. Unlike his other surgeries, that procedure was a lumbar fusion. Tiger had three prior lumbar discectomies, all done from a posterior approach. His latest surgery is called an anterior lumbar interbody fusion. In this procedure, a vertical incision is made below the bellybutton to the pelvis through the abdomen and dissection is carried out to the anterior surface of the lumbar spine. 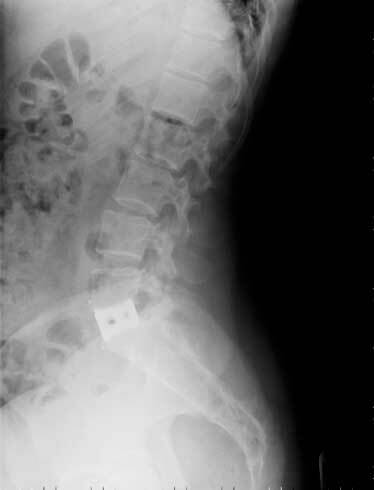 All of the disc is removed and a cage is packed with bone graft and placed between the vertebral bodies (see photo). This is secured into place with screws inserted through the cage into the bone above and below the interbody cage. This procedure generally provides 60-70% relief of the patient’s chronic low back pain by eliminating the motion at that level and creating more room for the nerve roots. This procedure also eliminates the possibility of a recurrent disc herniation, as all the disc is eliminated. Because of Tiger’s previous surgeries, he was not a candidate for disc replacement. Procedures such as this can produce excellent relief of back pain, and patients can generally return to their activities of daily living, although it is rare for them to be completely pain-free. Many patients can return to recreational activities such as golf, but it would be exceedingly difficult for anyone to return to professional golf due to the rigors of such a career. Recovery from an anterior lumbar interbody fusion can range from six months to a year. Current theory is that it takes nine months for the fusion to solidify. Extensive postoperative rehabilitation is necessary for both the abdominal and low back musculature.